Towards the Genomization of Food? 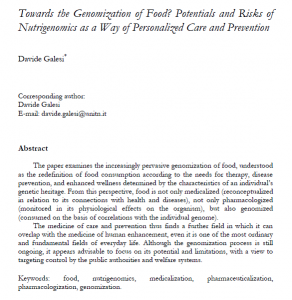 Potentials and Risks of Nutrigenomics as a Way of Personalized Care and Prevention (Davide Galesi, 2014). 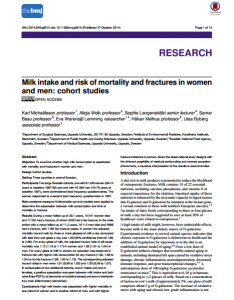 Milk intake and risk of mortality and fractures in women and men: cohort studies (Karl Michaëlsson, Alicja Wolk, Sophie Langenskiöld, Samar Basu, Eva Warensjö Lemming, Håkan Melhus & Liisa Byberg, 2014).